§ Keith Allen Daniels, science-fiction poet and small-press publisher, died in his home at Ridgecrest, California on Tuesday, December 18. He was 45. The cause was cancer of the colon, metastasized to the liver and lungs. His wife, Toni Luna Montealegre, was holding his hand. Keith was a prolific fantasist poet, with work in Analog, Asimov's, and dozens of magazines and anthologies. I managed to snag one, "Return of the Haruspex," for the Journal of Social and Evolutionary Systems (now defunct) which I edited from 1990-2000, but I first met Keith shortly after he started Anamnesis Press in the early 1990s. That wonderful tiny company published collections of poetry by James Blish, Joe Haldeman, and other notables  known and otherwise  and also two collections of essays by me, Electronic Chronicles (1992) and Learning Cyberpace (1995). I learned early on about Keith's generosity: He offered me a $100 advance for Learning Cyberpace, pleading tightness of shoestrings. I accepted. A check arrived a week later  for $200  and a note that said, "oops, my hand slipped when I was writing the check". He took a deep, personal interest in all of his authors  he and Toni sent mineral specimens, meticulously labeled from their expeditions in California deserts, to my kids, after I mentioned their interest in rock collecting. The subject of his poetry was often dark, but illuminated by an irrepressible sunshine of being. His métier was mixing macabre and light  he was an Impressionist of the night. Keith, wherever you are now in this Universe, we're worse here on Earth without you. § Scott Imes, 52, manager of Minneapolis SF specialty store Uncle Hugo's, the oldest in the US, died December 11, 2001. 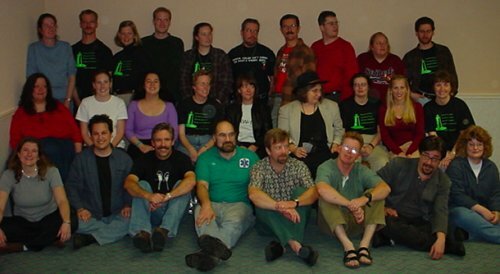 The SFWA obituary includes remembrances by Lydy Nickerson and Ken Keller. § PW NewsLine and PublishersLunch newsletters report that humorist Michael Gerber's "Harry Potter" parody, Barry Trotter and the Unauthorized Parody, is being self-published after editors from St. Martin's, Talk, Vanity Fair and others passed on the dicey proposition of displeasing Warner Bros., the studio that owns the Harry Potter film franchise. A parody in the tradition of Bored of the Rings, Barry Trotter is also a comment on commercialism, with a story about efforts to stop a movie, produced by Barry's mortal enemy, He-Who-Smells (the evil Lord Valumart), about the famed School of Hogwash. § Entertainment Weekly ranks Stephen King and Peter Straub's Black House at number 8 on its list of the top ten fiction books of 2001. Glen David Gold's associational Carter Beats the Devil is #6. American Gods and From the Dust Returned are also on bn.com's General Editors' Top 50, at #21 and #23, respectively. § The New York Times reports that book-buyers are increasingly affected by sticker shock. Cover prices have crossed thresholds over the last two years, and the big bookstore chains and online retailers have pulled back from previously widespread discounts. More shoppers face prices like $35 for hardcover nonfiction, $26 or more for a hardcover novel, $15 or more for upscale paperbacks. Customers show signs of resistance. Publishers say that, along with the rest of the economy, book sales have fallen off this fall. Some in the industry say publishers should reconsider their prices, especially in view of the many cheap alternatives to reading a book. § The Oxford English Dictionary is running a pilot project to gather words in specialist areas, beginning with science fiction. This site went public a few days ago, describing the guidelines for gathering citations and listing sets of preliminary citations for SF, SF criticism, and SF fandom. § We previously noted Amazon.com's list of 2001 Editors' Choice SF books, but we haven't noted that Amazon's overall Best Books of 2001: Editors' Choice list puts, out of all books published in the last year, China Miéville's Perdido Street Station at #11, and Connie Willis's Passage at #23. Further down: Neil Gaiman's American Gods is #26, Kage Baker's The Graveyard Game is #68, Charles de Lint's The Onion Girl #70, and Maureen F. McHugh's Nekropolis #84. § Author's Venue presents "A Writer's Renewal", a two-day intensive writing workshop with Bruce Holland Rogers on March 8 & 9, 2002, at the Sunrise Springs Inn & Retreat in Santa Fe, NM. Early bird deadline is January 15, 2002. Further details are on the website. § AOL Time Warner is terminating its controversial iPublish e-publishing subsidiary. SFWA had objected to the terms of its standard contract, which were considered harmful to authors. § Betsy Mitchell, previously Editor-in-Chief of the Warner Books science fiction and fantasy imprint Aspect, will become Vice President, Editor-in-Chief, of Del Rey Books as of January 2, 2002. Reporting to her will be Shelly Shapiro, Editorial Director, and Steve Saffel, Executive Editor. Kuo-Yu Liang will become Marketing Director, Del Rey and Licensing Developments, reporting to Anthony Ziccardi, Vice President, Sales Marketing Director. Or go to www.paypal.com and send to account Jane0615@aol.com, last name Osnovich. § William Jovanovich, who who turned Harcourt, Brace into Harcourt, Brace Jovanovich, died on Tuesday at the age of 81. § Juan Arreola, "a nationalist Mexican author known for vivid short stories that used fantasy to tell tales of self-discovery", has died at age 83. § The 26th annual Williamson Lectureship will be held on Thursday, March 7, 2002 on the campus of Eastern New Mexico University in Portales, New Mexico. This year's theme is "Dragons, Dinosaurs, and Darwin," a recognition of our evolutionary roots in science and the humanities and their interpretation by science fiction and fantasy authors. Joining Dr. Jack Williamson as this year's guests are George R. R. Martin and Michael Swanwick. The event will feature a luncheon at 11:45 with brief comments by the guests, followed by a panel discussion at 7:00 in the evening. Reservations for lunch may be had by calling 505-562-2422 or by contacting Patrice Caldwell at patrice.caldwell@enmu.edu . § The New York Times Book Review's Holiday Books Issue, dated December 2, published editorial selections of the Best Books of 2001 as well as extensive lists of Notable Books of the Year, including the following titles drawn from Gerald Jonas's SF reviews. The titles by Schroeder and Ford were published late in 2000, but reviewed in the past year's issues of the Book Review. The Roberts and Butler titles are reprints, first published in 1968 and 1980 respectively. Associational titles on the general fiction lists include Carter Beats the Devil by Glen David Gold (Hyperion), The Last Report on the Miracles at Little No Horse by Louise Erdrich (HarperCollins), Mr. Mee by Andrew Crumey (Picador USA), and The Wooden Sea Jonathan Carroll (Tor).  Brad W. Foster received the 2001 Rotsler Award at Loscon 28 in Burbank, California, over Thanksgiving weekend. Presented by he Southern California Institute for Fan Interests (SCIFI), the Rotsler Award honors the lifetime work of outstanding fanartists and the memory of esteemed fanartist William Rotsler. The annual award consists of $300 cash and an award plaque. Mike Glyer, Richard Lynch, and Geri Sullivan served as this year’s award judges. In related news, Michael Bernstein has launched Rotsler.com, an online archive of Bill Rotsler's work. Bernstein invites readers to contribute scans of Rotsler artwork to the archive; contact him at webmaven@lvcm.com. § This year's Viable Paradise SF writing workshop was held on Martha's Vineyard, MA, from October 21 to 27. Founded in 1997 by the late Rae Montor, VP is a week-long intensive writing workshop based on the Clarion model. Regular instructors include Debra Doyle, James D. Macdonald, and Teresa and Patrick Nielsen Hayden. Next year's Viable Paradise will be in September, once again on Martha's Vineyard. Applications will be accepted at the beginning of 2002. Other details as they develop will be posted to http://www.sff.net/paradise/. Instuctors are indicated by asterisks. Front: Erin Cashier Denton, Scott Janssens, Robert H. Beer, James D. Macdonald*, James Patrick Kelly*, Steven Gould*, Patrick Nielsen Hayden*, Lisa Silverthorne. Middle: Debra Doyle*, Stephanie C. Smith, Deborah Green, Carol Boyke, Beth Bernobich, Teresa Nielsen Hayden*, L. J. Baker, Lora Ann Livingood, Sandra McDonald. Back: Marjorie Fergusson, Darren Moore, Tonya Price, Robert Davies, Laurel Amberdine, Jonathon M. Sullivan, Michael J. LaMarche, John Aegard, Fran Wolber, Sean Finn.